For all the wrong reasons of course, but this weekend saw a first for S-Pulse: our game was reported on by the BBC. At 1-0 up Yoshida had a wonderful chance to double our lead, and it came from a lovely bit of build up. Alas it wasn't to be. I was otherwise engaged and didn't see the game, so apart from that, I'll let the highlights speak for themselves. On the face of it not a bad away draw against a team meant to be challenging for the title come December. 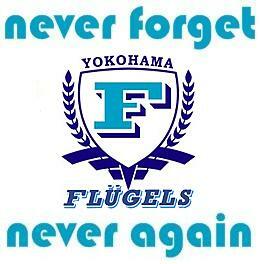 This Saturday we welcome FC Tokyo to town, kick off 3pm. They lost 4-0 at home today and are yet to pick up a win this year. I don't get to many games these days. Its not for lack of interest, but living in Osaka means I don't have the pleasure of watching S-Pulse very often. Add to that a full time job, a cheeky four year old and a university course in my free (haha) time, and its just another thing I wish I could do more often. 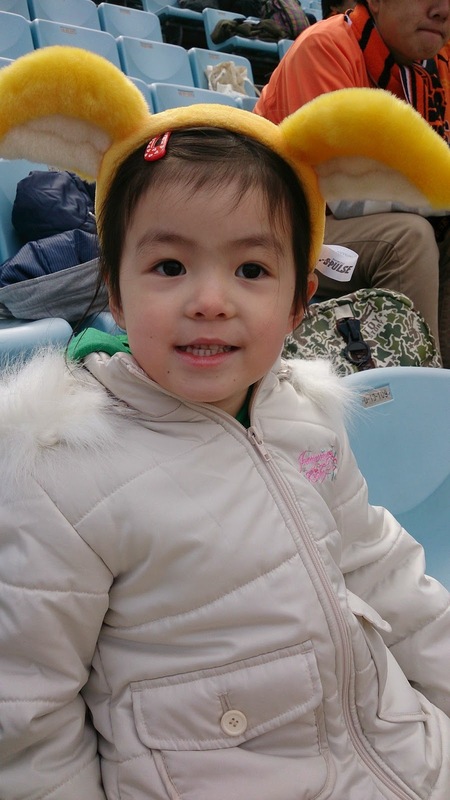 Last year when we played Cerezo I was bullied by a then three year old into going to Disneyland instead. Anyways, it was a year and a half since my last game and I almost wish it still was, after yesterday. We didn't just lose, 4-1 is a proper drubbing. Based on that, I decided after consulting with Barry to report the game from the four year old's perspective, because she had a great time and has been singing S-Pulse songs non-stop ever since. From the moment I told her where we were going for the day, it was all about Pal-chan. She ran to get the ears, and would have taken her stuffed Pal and Pikal if I had let her. Despite Cerezo's Robbie sympathizing with the S-Pulse support as we cannot attend next weeks match at Urawa, he did not cut the mustard with Aisha. Nor did his female counterpart as she rode around on her bicycle. "But where's Pal-chan, Mummy? I want to see him!" It was almost her first game ever, and to be honest, I expected her to be bored silly and distract me from the game. But NO! She asked good questions, and started to understand, even yelling out a "YES!!!" followed by a disappointed "oh, no" as the Cerezo keeper punched away what had looked like a promising on-target attempt. She got angry with events leading up to our penalty -" that pink man is MEAN." and yelled "go go go" when we were on the attack. She wasn't impressed that we didn't win. But apparently we will the next time, and she is definitely interested in going to more games. 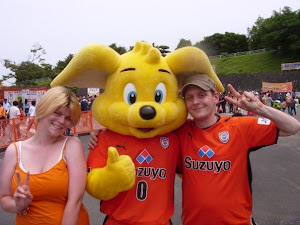 I plan to get her to Nihondaira as soon as possible - shame there isn't a derby to go to this year. In the meantime, orange has replaced pink as her favourite colour, and that is no mean feat. To sum it up : "I like S-Pulse Mummy. Shimizu is the best!" After the "JAPANESE ONLY" banner which was hung, and left up for the whole game, at an entrance to Saitama Stadium's home end last weekend, we're set in for a new first for the J. League: a game to be played in an empty stadium. The J. League, with speed that can only be applauded, moved more swiftly than anyone dared hope and punished Urawa for their failure once again to control their fans. The incident is the latest in a tiresome list of miserable, mean spirited behaviour by a small number of the Saitama team's fanbase. After the banner went viral, all manner of explanations were touted as to its meaning. Seriously, though? Something like that, written in English, is fairly unambiguous. Let's be honest, it was nothing other than a hopeful attempt at apartheid in Saitama. Urawa most likely have the biggest number of foreign faces in any given J. League crowd, which makes it all the more daft. Since when did racist nut jobs have a coherent grasp of reality, though? So long story short, our game in Saitama on March 23rd will be played inside an empty ground. All tickets will be refunded, along with travel/accommodation arrangements already made by fans. 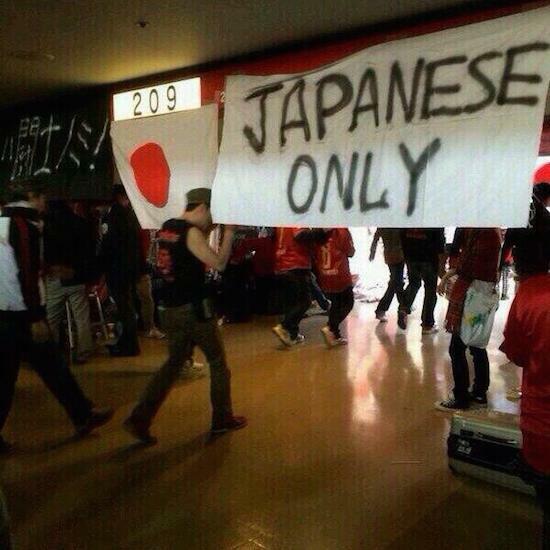 Urawa are being forced to foot this bill, and rightly so. It's not yet decided if fans will be allowed to congregate outside the ground, but, if you ask me, that would be asking for trouble. Given the desperate posturing of some Reds fans recently (fireworks set off at our team bus? seriously?) the police would have to be out in force to make sure that element didn't run riot, and I can't see anyone going for that. This is a pretty huge deal for the J. League, and I'm glad the judgement came strongly and quickly, but the fact hundreds of Shimizu die hards will be missing a game is massively disappointing. 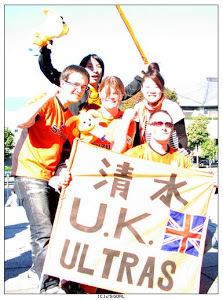 Perhaps the logistics of allowing only away fans in was too much to organise, but there's a deep feeling of injustice among many of my Shimizu brothers and sisters. Not to mention of course the thirty-odd thousand blameless home supporters, but after years of, albeit a minority's, misbehavior, a line finally had to be drawn. I think the punishment is firm, fair and sends a loud and clear message. The reverberations of this incident will continue to be felt. Urawa announced an overhaul of the way their supporters will be handled, and how they'll have to conduct and organise themselves. Not a moment too soon, either. As the best supported team in the country, for years they've been a consistent embarrassment to themselves. Most of them are totally fine of course, but those are the same people who let the offending flag hang over that entrance for the entire game. That is poor form.